Raising a family in North Wales means that I have learnt to embrace the wet weather that we seem to have seventy-five percent of the year. My kiddos don’t share my dislike for the rain and have always been keen to go outdoors and play no matter what the weather. Just the last week, my ten month old had me standing outside, hiding under an umbrella in the pouring rain as he was desperate to be outdoors and watch the trees moving in the wind. 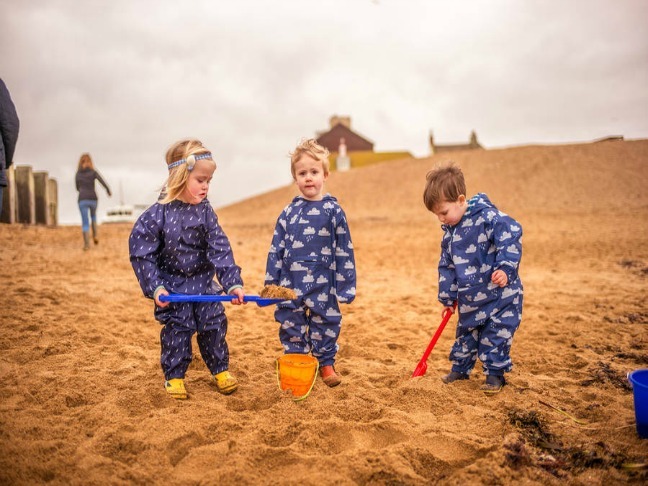 The key to successful rainy day adventures is having the best raincoats, waterproofs, and wellies for your little adventurers. 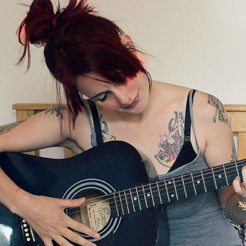 I’ve tried it all, and here’s what’s worked best for my family. Rain often brings cold weather, so I always start with a base layer that will keep little bodies nice and snug. Cold children usually equal grumpy children, in my experience. A set of merino wool thermal underwear will keep little limbs nice and cosy, without the need for lots of bulky clothing that hinders play. 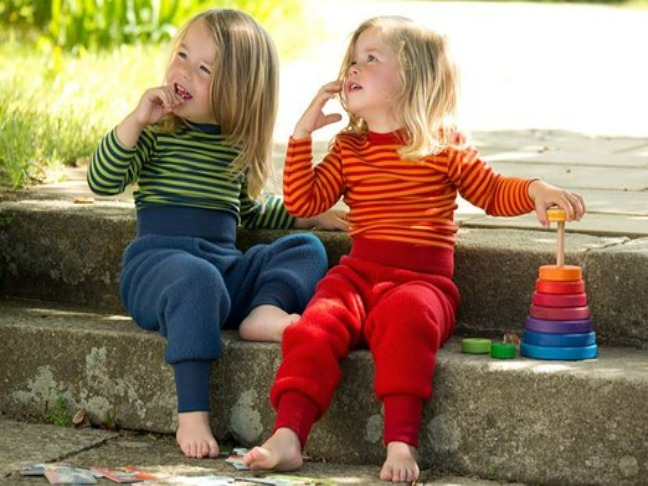 These striped organic wool/silk tops and bottoms from Lana Bambini (£20.00) are a great choice. Having the right waterproof kit is a game changer, and Swedish brand Didriksons is where to go. 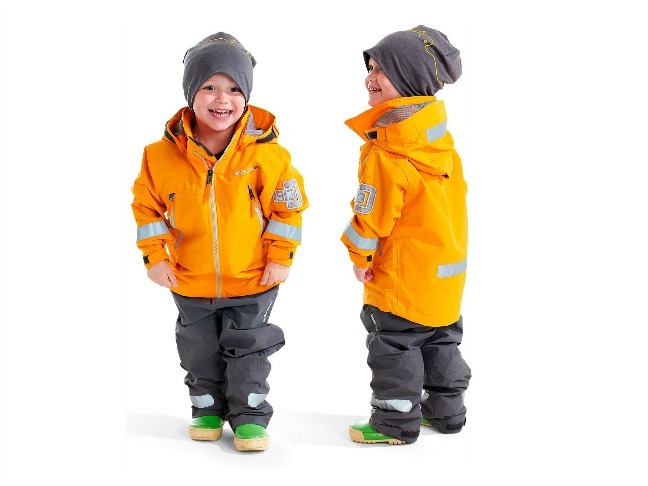 Completely waterproof, breathable, and insulated, the children’s outerwear (from coveralls to bib trousers) even comes with Extend Size, an inside-seam system in the arms and legs that enables the item to be expanded by approximately one size as your child grows. It’s just as important to keep those little fingers warm and dry, and their mittens (£14.50, VikingKids) are perfect. I’ve found over the years that all-in-ones are a better choice for little ones that separate waterproof tops and trousers. Gaps between tops and trousers usually mean a wet patch! I love these Muddy Puddles Puddle Pac All-in-Ones (£20.00). Aside from keeping your little one nice and dry, they fold down into a little bag—perfect for keeping in the car or pushchair for spontaneous rainy adventures! I don’t think you’ll find many toddlers who don’t love splashing in puddles. Even my tweens still like a splash if there is no one watching! Encourage your little ones to get out in the rain in some magical clothing that changes colour when it gets wet! 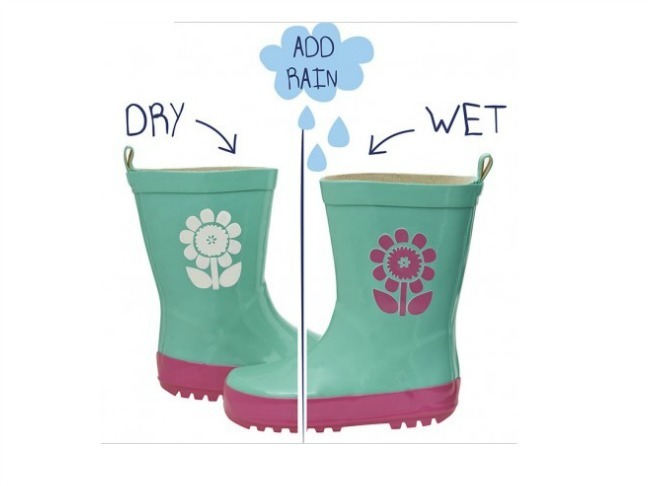 These fabulous wellie boots from Squid Kids (£24.00) feature colour-changing pictures that change colour as soon as the rain hits them! They also sell colour-changing bags, coats, and umbrellas—your little one will be desperate to get out in the rain with these fab products!